Guys Christmas is in it two days how exciting. I love Christmas it is my favourite time of the year. Everything is so beautiful, it is a time where friends and family gather together but also it is the time to celebrate the birth of the resurrected king Jesus. For God so loved the world that He gave His only begotten Son, that whoever believes in him shall not perish but have eternal life. (John 3:16) . I am back with a style inspo post, I know I have not done one for ages and missed making some but hey you can expect a lot more coming in 2018. I came out with a style inspo for you, not the usual red dress or glitter dress we see but something fashionable and still in the mood of Christmas. 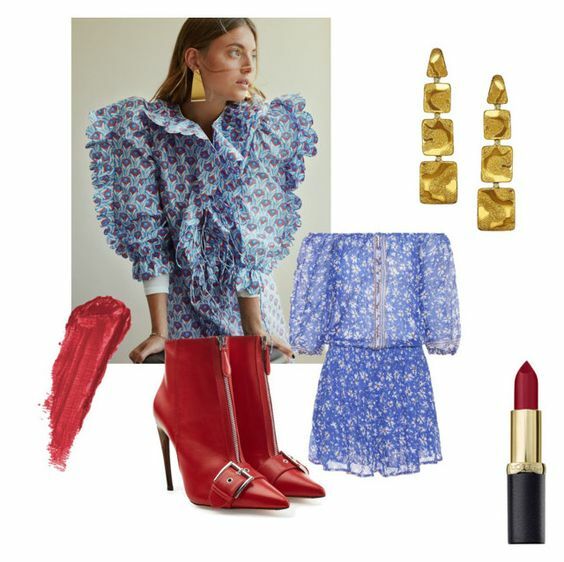 For the look, I went for a beautiful Poupette vacation clothing dress added with gorgeous red Alexander McQueen ankle boots, a pair of Alex Soldier Gold Cora drop earrings and to finalise the look a L'Oreal color riche matte addiction lipstick. Also, if you celebrate Christmas how do you usually celebrate Christmas. For my part, I have always celebrated Christmas with my family but it has changed for the last couple of years. Since, I have moved to England I am not always home for Christmas and it is tuff for me. This year will be my second year away from my family for Christmas, and of course it saddest me a little bit but I don't let this affect me instead I look around me and thank God no matter what or where I am. I wish you all a Happy Christmas, for those who will celebrate it family cherish this precious family and for other away from their family you are not alone and always be thankful no matter where you. Thank you so much for passing by and reading. The red boots are so pretty! Oh, my! This look is so pretty! I love the red boots you included. This red booties are beyond amazing! That dress is beautiful! Hope you had a merry christmas! the red boots are my highlights. Absolutely LOVE this look! I'm so sad the Christmas season is already over - I'm refusing to take down my tree quite yet, lol. The blue dress looks amazing!